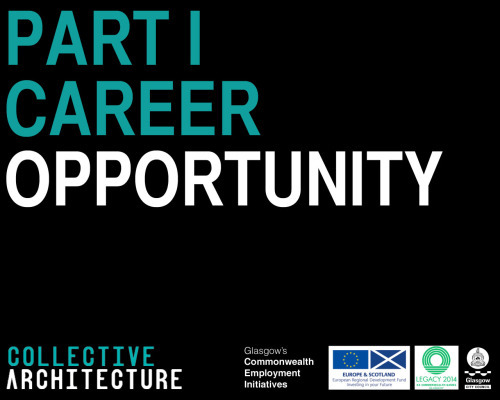 Collective Architecture is looking for a Part I architectural assistant to join its team. Special Requirement: All Graduates applying for this position must be pre-registered to the Commonwealth Graduate Fund. For more information on the scheme phone 0141 287 7282 or email commonwealthgraduatefund@glasgow.gov.uk. Job Description - Collective Architecture is an award winning practice providing architecture, urban design, exhibition and lighting design services to an diverse client base. We are seeking an enthusiastic Part I architectural assistant to join our friendly and ambitious practice. We believe in providing a solid all-round Part I experience, which gives a good foundation for Part II and beyond. We also offer the opportunity for our Part Is to work across all project stages. As such, we are looking for an applicant who is creative and highly motivated with a range of skills, including excellent design ability, technical aptitude and a fluent knowledge of Adobe Creative Suite. The ability to hand-draw and make models, as well as an existing knowledge of PowerCADD, would be advantageous. Collective Architecture encourages all members to take part in broader office meetings, presentations and social events, which will be of benefit to both the successful applicant and the Company.